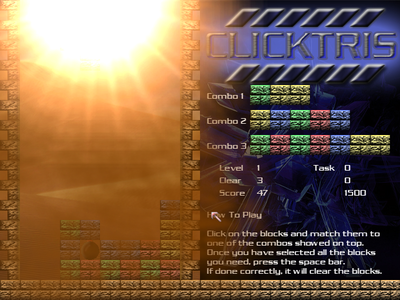 Click on the falling, or sitting, blocks and match them to one of the combos showed on the right half of the game. Once you have selected all the colors you need, press the space bar. If done correctly, it will clear the blocks, otherwise, nothing will happen. 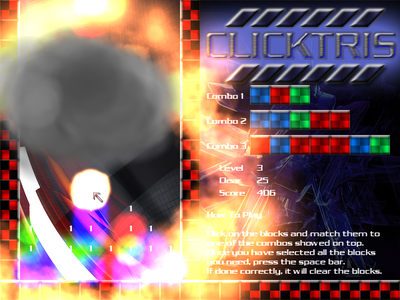 There's also a few items that will help you to clear the blocks. Edited by [Cool*Beat], 06 May 2014 - 06:09 PM. This was pretty impressive! 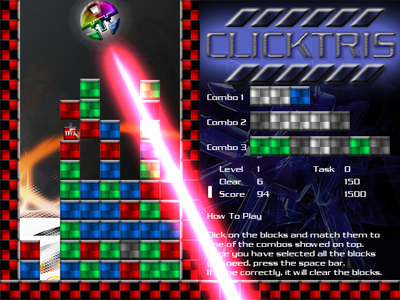 I liked it, a fun spin on Tetris--a mix between those click-and-match games and Tetris. Sound: 3/5 -- the sounds were not the greatest, those grunts when you cleared blocks. Also, the title screen music was really cheesy and fake-sounding. Original music would have fit into this game better. Concept: 4/5 -- items, combos, clicking, etc... very many spices! However, it's not a very unique concept. Gameplay: 4/5 -- it was entertaining, and pretty intense when the towers were about to get too high. However, the beginning should have been more involving (of adventure mode). Programming: 5/5 -- as far as I could see, there were no programming errors. Bonus: 5/5 -- there were plenty more modes besides adventure mode, always a good thing to put into games! Please note that the overall grade isn't really very fair. Although it gets a 5/5 from me, keep in mind that it's not 100% great, even to me. Please try to improve the downsides I mentioned, and it's a golden game. Edited by BENJAMUS, 03 February 2009 - 03:31 AM. 9.4 MB's pretty big for a puzzle game, and the download/loading ended up taking up quite a bit. Aside from that--cool gameplay idea, wouldn't seem very exciting on paper but it ended up having some lasting appeal. Graphics were great, loved the ripple effects, and the sound effects were great too-- "Excellent!" and all. But the happy party music didn't seem to fit in, somthing a bit more chill and electronic might have fit better. In the end, the game didn't throw new things at me enough to keep my attention; I was playing level 2 and the level began to drag on after a while, until the block killing became stale. Powerups or something would have been a good idea to help keep the game alive. Hey thanks guys!!! will improve on the music, will in the adventure mode it started of and easy start for the first 4 stage after that item will come in on the stage 5 in the desert because i want the player to feel for the play first. and then slowly making it diffecult in the end. Meet the requiement is the key like on stage 2 just ingore the combo2 if you want to get a fast win keep doing combo1 until you game unless it requie score then you will need some combo2 to help you, same goes to combo3. If you completed all of it you will Unlock Item Drop where u can use it anytime in the game. the download like work for me, maybe you can try it again ? *Save game can be load back. Copy the "clicktrissave" to the same folder.